name for a fall-flowering plant (Crocus sativus) of the family Iridaceae (iris family) and also for a dye obtained therefrom. The plant is native to Asia Minor, where for centuries it has been cultivated for its aromatic orange-yellow stigmas (see pistil). Dried flowers are used as a less expensive substitute for saffron. Safflower is extremely effective in lowering cholesterol levels. Laxative effect helps bowel movements. Encourages menstruation and treats abdominal pains. Helps skin heal open wounds and bruises. Used for all kinds of skin disorders like rashes, measles. Tea used for hysteria, panic attacks, fevers, mucus. Yellow, orange or red globular flowers, one to five per branch. Each flower contains 15-20 seeds, which are the source of the famous safflower oil (flavorless and colorless, like sunflower oil) Safflower seeds can be used in bird feeders instead of sunflower seeds because squirrels don’t like them. 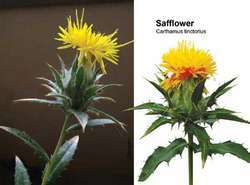 Safflower oil is also used as a medium for oil paints. If you want to use natural pigments and dyes, mix them with safflower oil to paint. Carthamus tinctorius. An annual thistlelike herb belonging to the composite family (Compositae); the leaves are edible, flowers yield dye, and seeds yield a cooking oil.